Why are so many black and tan hounds such great scenters? From Russia in the north east to Sweden in the north west and from Greece in the south to Finland in the far north, even to Basenjis in the Congo and Coonhounds in the States, most countries sporting scent-hounds feature a black and tan coated version. Do the genes for this handsome coat colour also embrace some ace-scenter content? Our Bloodhound, Ireland's Kerry Beagles and Scotland's Dumfriesshire Foxhounds, now sadly lost to us, feature this distinctive jacket, as do some Welsh Foxhounds and Otterhounds. 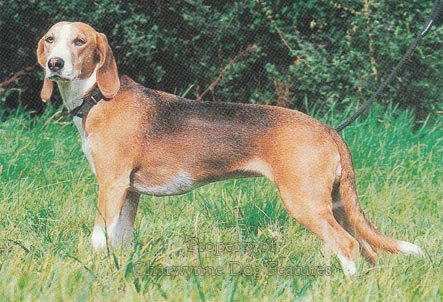 Tricolour is favoured in Foxhound and Beagle equivalents with the white facings often producing an even more handsome look. 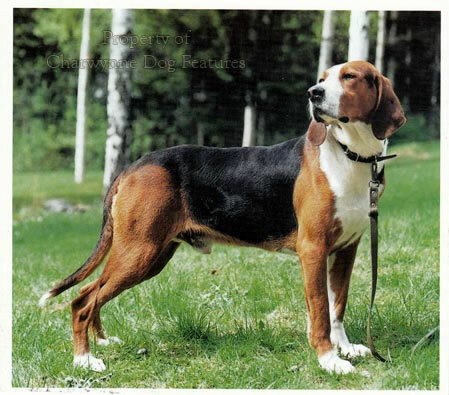 German, French (the St Huberts especially), the Dutch, Spanish and Italian scent-hound breeds can also exemplify the tricolour coat. Did our sporting ancestors know that this coat colour combination gave improved scenting powers to its wearers? When working abroad I must admit to confusing some black and tan scent-hound breeds, especially when they operated across national borders. 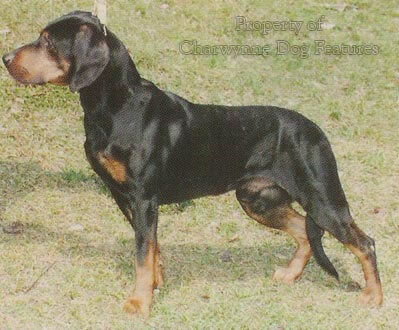 The Swiss Jura Hound, for example, can be seen across adjacent borders and was undoubtedly developed from foreign stock. The Germans favour black and tan in their working breeds, as their shepherd dog, Dobermann and Rottweiler demonstrate but their hounds too, as the Steinbracke and Dachsbracke are preferred in this colour combination. Fondness for this jacket varies in France, apart from the root of so many scent-hounds in this part of Europe resting in the St Huberts, but to the east the Polish, Hungarian, Lithuanian and Russian sportsmen prize their hounds in this colour. In Scandinavia too, the black and tans - from the Hamilton and Smalands-stovare to the Finnish Hounds further east are greatly valued and very well-bred. I have seen Finnish Hounds in their native country that simply take your breath away. Further south, the Segugios of Italy, the Greek Scent-hound and those of the former Yugoslavia may not be hunted in packs but give treasured service to their local hunters, often in difficult terrain. But, all over the world, the black and tan Bloodhound is the scenting king. In the late 19th century, itwas not unknown for Bloodhounds to feature white markings: a white star on the chest, a white tip to the tail and even the spotted ‘snowstorm’ c oat with flecks of white along the saddle, rather like the early Labradors known as ‘hailstone-coated’. The writer and author of a century ago, Frank Townend Barton once bred a pure white whelp in a purebred Bloodhound litter and, to his subsequent regret, consigned it to the bucket as an ‘undesirable’ anomaly. Genes act in a random not a mathematical manner; the range of a breed’s gene pool will always reveal its past in time. A deep red with tan markings was once much more common, with some fanciers preferring a tawny hue, mixed with black, on the saddle. Today’s KC-ordained breed standard stipulates: Black and tan, liver and tan (red and tan) and red, but allows darker colours sometimes interspersed with lighter or badger-coloured hair and sometimes flecked with white. A small amount of white is permissible on the chest, the feet and on the tip of the tail. I have yet to come across a show breeder who welcomes white markings in his stock. Truly, there is no threat to any breed from the colour of its coat; the only threat to a hound breed comes from an inability to hunt. 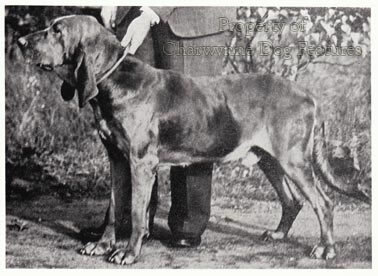 Historically, the Bloodhound was very much part of the chase, featuring in Landseer’s paintings of the deer hunt, with their unique tracking skills leading to their use all over the world. The ‘father’ of the breed here was Edwin Brough, whose hounds were as much admired in the show ring (where his kennel won over 700 prizes including 386 ‘firsts’), as employed as scenters by a variety of users. 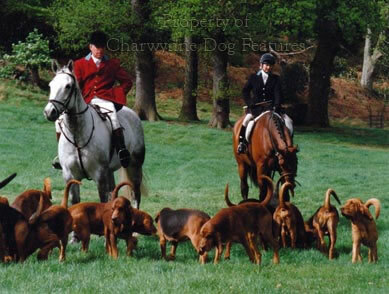 His hounds were sound physically, lacking the super-elongated ears, excess of loose skin, distressing display of haw and over-abundance of dewlap/throatiness – condemned a century ago but still seen in the show-rings today. A famous tracking pack was the Ledburn – usually about five or six couples hunting at least once a week in the winter in the Vale of Aylesbury until the outbreak of the Second World War. They were famous for their voice too. Ledburn Boswell and Ledburn Baal each, separately, hunted his man twenty four hours cold over Corrie Common in Dumfriesshire before the Second World War and, after that war, Mrs Oldfield’s hound won the Brough Cup for hunting a six-hour cold line for 3 miles in 20 minutes. In his Dog Breaking of 1909, General Hutchinson remarks on the value of this breed in tracking poachers: “…for the fear poachers naturally entertain of being tracked to their homes at dawn of day would more deter them from entering a cover than any dread of being assailed at night by the boldest armed party.” I give many marks to those stalwarts who still carry out tracking trials, or hunting the ‘clean boot’, for their hounds and retain the famous ability in these majestic animals. Scope for gamekeepers here! In The Badminton Magazine of Sports and Pastimes , Volume XV, July to December, 1902, Russell Richardson wrote: “From what has been briefly written it will be seen that hunting the clean boot may easily be added to the pleasures of country life; however limited one’s own property may be there should be little difficulty in obtaining the necessary permission to cross sufficient land to make up any number of good runs, and this form of hunting has the advantage that a course can always be chosen in the direction one desires to take, and no damage whatever need be done. Most interesting and instructive experiments might be easily tried by means of the bloodhound, and many points on which hunting men differ might be put to a series of useful tests – such, for instance, as whether scent is destroyed by a sudden frost, and, if so, whether totally or only temporarily, and in the latter case whether the line could be taken up again immediately on a thaw setting in…” He makes a simple case for the sport to become much more widespread than the present tracking programme, with huge benefit both to hounds and their owners. Whatever the style of tracking or scenting, the black and tans rule!